The team spent the Octobers of 2017 and 2018 exploring the archaeology of the Spur Battery at Fort Amherst. In 2017 we explored the area east of the amphitheatre and confirmed that many of the buildings shown on the Victorian maps had been demolished and the site levelled. We did find a number of military buttons and also toys from the military families who lived in the adjacent barracks. In 2018 we targeted a building we knew once existed to the west of the amphitheatre. Brickwork appeared on day one and after two weeks of hard work by the volunteers, we realised we had uncovered the Victorian soldiers’ earth closet, a huge cavernous toilet! One particularly nice find was an officer’s porcelain smoking pipe. Schools, youth groups and volunteers from Medway and beyond took part in the project, with some great feedback during the work and online through social media. 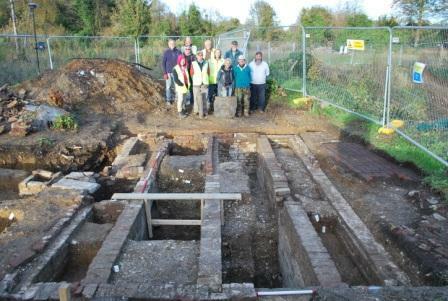 We also answered the age old archaeology question of where did people go to the loo? Click here to view news coverage from Kent Online. 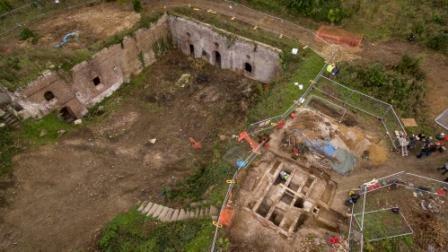 This entry was posted in News & Events and tagged excavation, fort amherst. Bookmark the permalink.